SMS Coln (Cologne in English, also sometimes written as Koln) was a German light cruiser, the second to bear this name, after her predecessor SMS Coln had been lost in the Battle of Heligoland Bight. Both were named, of course, after the German city of Cologne. Coln, the first of her class was ordered under the nameErsatz Ariadne and her keel was laid down at the Blohm & Voss shipyard in Hamburg in 1915. She was launched on 5 October 1916, after which fitting-out work commenced. She was commissioned into the High Seas Fleet on 17 January 1918. The ship was 155.5 metres long and had a beam of 14.2 metres and a draft of 6.01 metres. She displaced 7,486 tons at full combat load. Her propulsion system consisted of two sets of steam turbines (total 31,000 shp) powered by eight coal-fired and six oil-fired Marine-type boilers. These provided a top speed of 27.5 knots and a range of approximately 6,000 nautical miles at 12 knots. 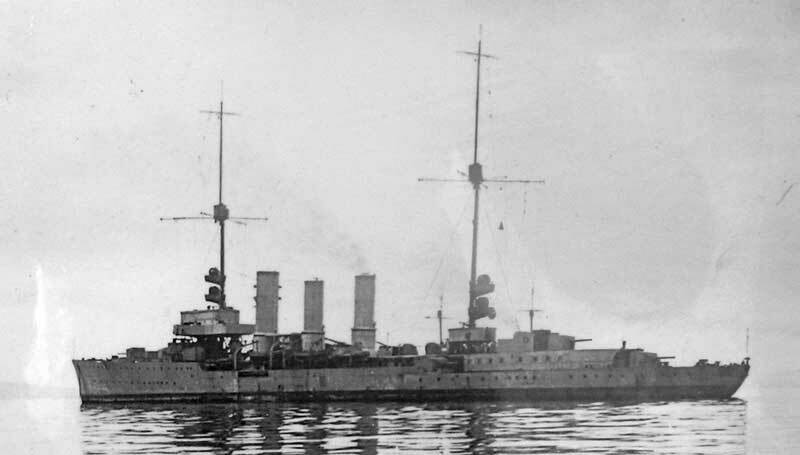 She and her sister SMS Dresden were the last two light cruisers built. The ships were an marked improvement over the preceding Konigsberg class cruisers. The new ship was armed with eight x 15 cm SK L/45 guns in single pedestal mounts. Two were placed side by side forward on the forecastle, four were located amidships, two on either side, and two were arranged in a super firing pair aft. These guns fired a 45.3-kilogram shell and could fire to 17,600 metres. Coln also carried threex 8.8 cm SK L/45 anti-aircraft guns mounted on the centreline astern of the funnels, though one was removed in 1918. She was also equipped with a pair of 60 cm torpedo tubes with eight torpedoes in deck-mounted swivel launchers amidships. She also carried 200 mines. She was crewed by 17 officers and 542 enlisted men . As the Coln was only commissioned less than ten months before the end of World War I, she saw little service and in fact, she did not see action. She participated in a fleet operation to Norway over 23 to 24 April 1918 to attack British convoys but they failed to locate any and so returned to port. Like most other ships, Coln was to have participated in a climactic sortie in the final days of the war but a revolt in the fleet forced the cancellation of the operation. Following the capitulation of Germany on 11 November 1918, most of the High Seas Fleet's ships, under the command of Rear Admiral Ludwig von Reuter, were interned in the British naval base in Scapa Flow, Orkney Islands, Scotland. Coln was among the ships interned. On the voyage there, her captain radioed the fleet commander that one of the ship's steam turbines had a leaking condenser. 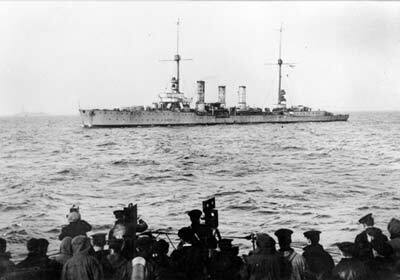 Reuter dispatched another light cruiser to remain with the ship in the event that she needed to be towed. 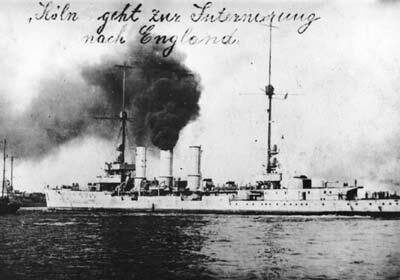 Despite the problematic turbine, Coln managed to steam into port, the last ship in the German line. Upon arrival, all wireless equipment was removed from the ships and the breech blocks of their heavy guns were removed to prevent their use. Crews were reduced to minimum levels. The fleet remained in captivity during the negotiations that ultimately produced the Treaty of Versailles. Reuter believed that the British intended to seize the German ships on 21 June 1919 which was the deadline for Germany to have signed the peace treaty. Unaware that the deadline had been extended to 23 June 1919, Reuter ordered the ships to be sunk at the next opportunity. On the morning of 21 June 1919 the British fleet left Scapa Flow to conduct training manoeuvres, and at 11:20 am Reuter transmitted the order to scuttle their ships. The Coln sank at 1:50 pm. 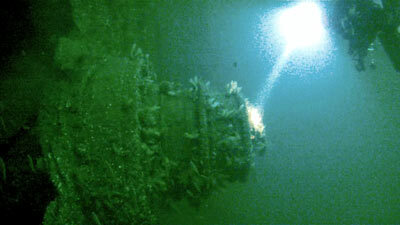 The salvage work on the Coln included remove the prop, as well as torpedo tubes and engine turbines. 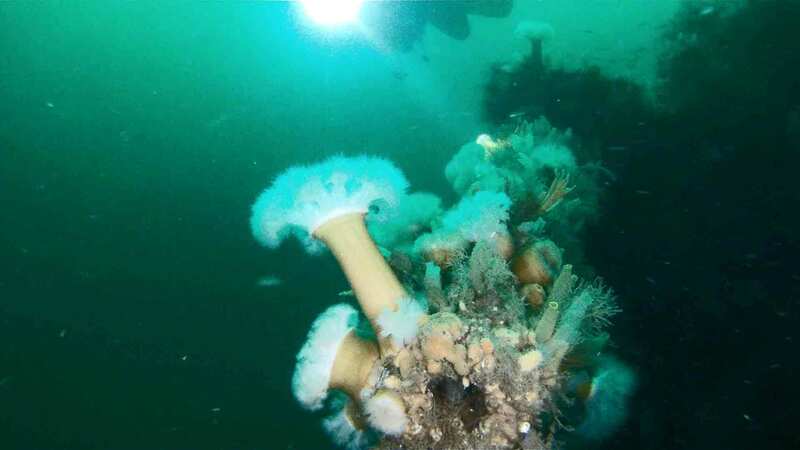 Today the remains of SMS Coln lie on the bottom of Scapa Flow at GPS N58º 53.83' W3º 08.45' using WGS84. This is about two and a half kilometres north-east of the northern point of Cava Island. 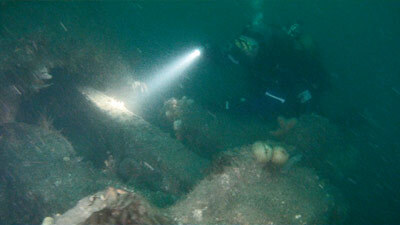 The depth here is 34 metres and the ship is laying on her starboard side with her bow facing roughly north. There is a shotline tied to a davit near the bridge at 20 metres. Once you drop to the side of the hull where the shot is tied, drop over the hull side and go to about 30 metres. Head forward and you will see the bridge straight in front of you. It sticks out a lot from the deck. There is also a mast coming out and running across the sand. There are a lot of support brackets for the mast. The bottom level of the bridge has a 5.9 inch gun barrel angled from the stern to bow. Inside the barrel there was a huge conger eel! In front of the bridge is the conning tower where the firing of the ship's guns wass controlled from. If you look carefully you can see half of the rangefinder which points down at the top of the tower. There is a door at the rear starboard side which permits you to look inside the tower. In front on the deck are two gun mounts. One is higher than the other as they were located either side of the centreline. The guns are not present, presumably they fell off or were salvaged. Forward are two large anchor capstans that look like wedding cakes. There are a lot of holes in the deck and hull here. At the bow there is no anchor on the port (higher side). From here head back to the bridge and look under it at the 5.9 inch gun again. It is 34 metres here. For most of the dive so far you will have been more likely to be at 28 to 30 metres. 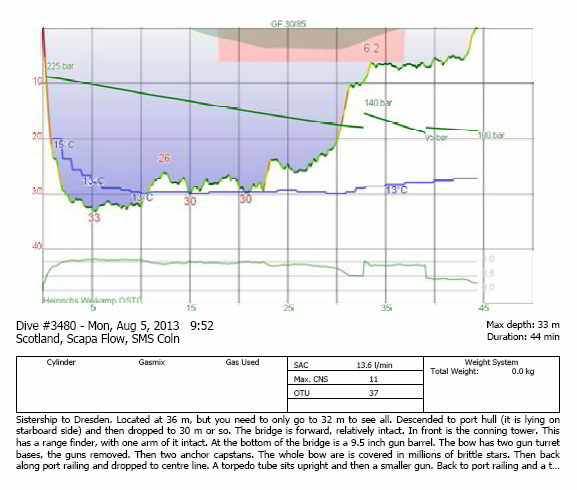 We used 26% Nitrox on this dive and we did not hit decompression till 18 minutes. It will have taken you about 15 to 17 minutes. From the bridge head towards the stern. Swim along the centreline of the ship and you will pass over three holes. These are where the funnels were attached. If you look inside you will see bits of the boilers. 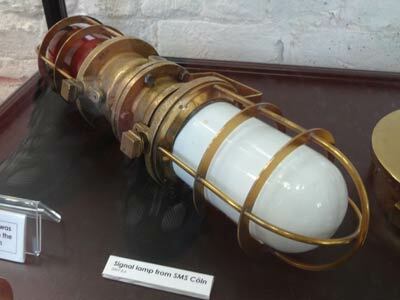 After a while you will come to a torpedo tube which is standing vertically. Past here is a smaller gun which points back to the bow. At this spot the hull is broken by salvage works. Turn around and head back towards the bow, but ascend at a 45° angle. Up near the port side you will see a large rectangular box. This apparently held torpedoes. From here head forward just below the highest point and you will see another series of holes, about four or five. These are entrances to the coal bunkers. Inside you can see some coal. It should now be about 25 to 27 minutes into the dive. If you still have time and air, spend the rest of the dive near the higher part of the bridge. Go up to the port hull and the davit. You can ascend up the shotline here or shoot an SMB. 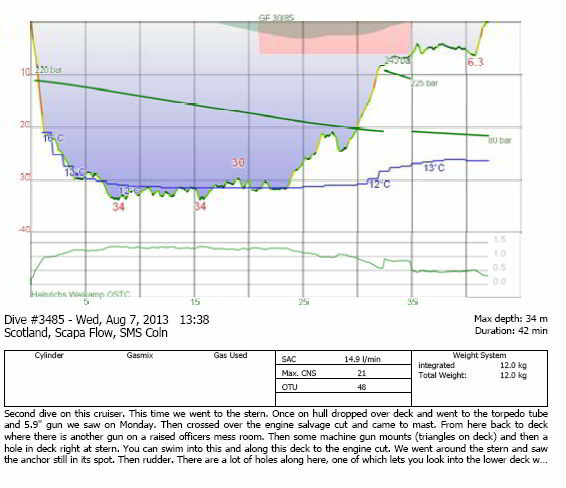 We did 30 minutes on this dive (using 26% Nitrox) and had to do five minutes decompression at six metres. 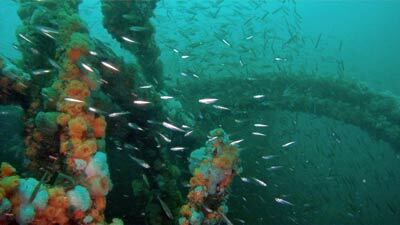 For a second dive on the wreck, descend again down the shotline to the davit just behind the bridge. From the port side at 20 metres, drop over the deck (side) and head off to the right at 45°. Once you get to about 30 metres, follow the centreline of the ship over the funnel holes till you come to the torpedo tube. Have another look at this and then continue towards the stern. You will see the smaller gun just past here (pointing back to the bow). As mentioned before, the ship is broken here by salvage work. 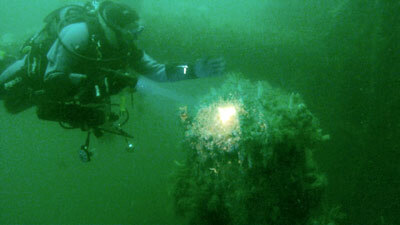 Follow the higher edge of the wreck across the salvage work. The deck has peeled back a bit here. Go around it and you will see some turbine parts in and around this area. Just past the peeled back deck is another large mast which runs out to the sand. 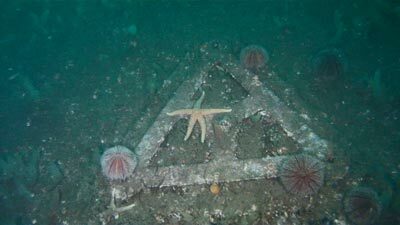 Follow the mast back to the deck and you will see at least two machine gun mounts that look like triangles. Head towards the stern and you will see the first of two 5.9 inch guns. This first one is on a higher deck than the stern-most one. Under this is the officers' mess. The one at the stern has a barrel that is aimed a bit higher towards the stern. At the stern you will see an anchor in a slot on the port side of the deck. There is a large hole here in the hull which enables you to enter the hull and swim back on the first deck to the engine room area. However, head back around the stern and you will see the rudder (which hangs down towards the sand) and the prop shafts. There are many holes in the hull and if you look carefully you will see the steering gear, including two steering wheels. Go up and over into the engine room salvage area. Again, look carefully and you will see some turbine parts. You will have been down about 25 minutes by now. Head back to the deck and then towards the bridge, ascending as you go till you are at about 22 to 24 metres. After a few minutes you will probably be low on air and need to ascend. Go back to the port hull and find the davit (if you want to ascend the shotline) or send up an SMB. We did 30 minutes bottom time using 31% Nitrox and had to do three minutes deco at six metres (using 50% on deco). 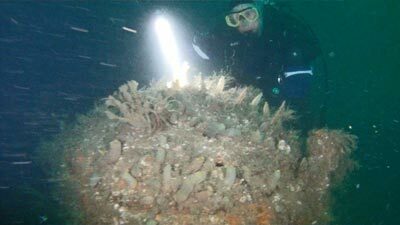 This is a great wreck, make sure that you do at least two dives on it. 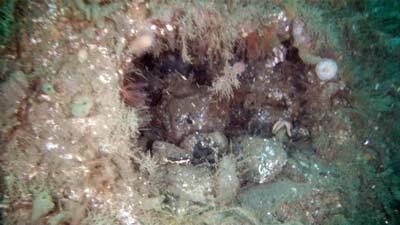 Visibility was varied on the two dives we did from about five to seven metres and 10 metres. Water temperature was about 11 to 12° in early August. 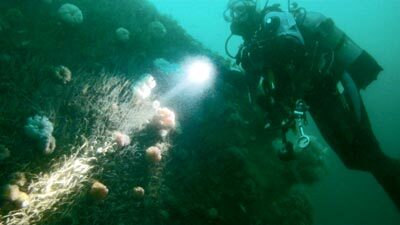 Below is a video Kelly and I shot on our two dives on the Coln. Kelly edited it.